How is it that professional athletes can play hurt or beat themselves up on game day, and a week later they can do it again – and continue to do this week after week, year after year? More than likely, they’re getting “fixed up” with cortisone shots. You see, science has learned how to trick the body into feeling better and working harder. But this quick fix isn’t good for athletes — and it’s not good for you. In this article, I’ll tell you what research says about the serious potential side effects of cortisone injections. You’ll also learn safer and more effective ways to treat pain, whether it’s upper or lower back pain, neck pain, joint pain, sciatica or any other type of chronic pain. Use these quick links to browse the article. What are cortisone shots and what do they do? They are all referring to essentially the same thing: When you are experiencing significant pain, a health care professional delivers a single injection of corticosteroid medication into the body part that’s causing you pain. The goal is to reduce inflammation in that one specific area, providing short-term relief. Some people feel better within hours, while others experience pain relief the following day. 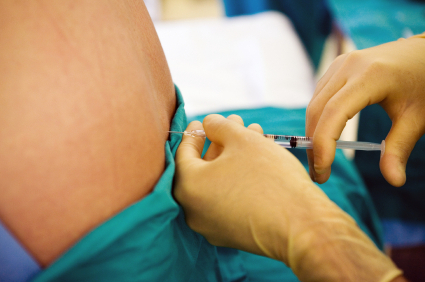 Epidural steroid injections target the area around the spinal cord. This is the area where your nerve roots exit and branch out to other parts of your body. The area near the nerve roots may be the source of low back pain. Tendons are the tough, fibrous cords of tissue that connects your muscle to your bones. Steroid injections are often used to treat tendinitis, or inflammation of the tendon. Bursae are cushions of tissue that reduce friction between muscles and tendons as they move across bones and other joint structures. Cortisone shots can be used to treat bursitis, or inflammation of the bursa. Steroids are sometimes injected into a joint to reduce joint inflammation caused by arthritis. While it’s true that steroid injections CAN reduce localized inflammation — and that can help you feel better temporarily — the success rate is actually pretty low. They also hurt… a lot. Especially if you have the steroid medication injected into a joint. Sure, the healthcare professional at your doctor’s office might use a local anesthetic mixed in the syringe to make it a little less painful, but it’s not uncommon for people to suffer allergic reactions to those anesthetics(ii) — and they tend to wear off pretty quickly. Cortisone shots are NOT a long-term strategy for pain relief. They do nothing to treat the underlying cause of your pain. And what’s worse, they may even make your problem WORSE. They also discovered some patients, such as those treated for tennis elbow, had significantly worse long-term healing results. Cortisone injections are an anti-inflammatory agent, but many joint and tendon injuries are actually degenerative in nature. So while you may temporarily reduce the symptoms, you’re not getting the real healing needed to correct the problem. And you might compound the problem in the long run. Cortisone shots have been around since the early 1950s, and it remains a primary treatment for general healthcare practitioners all the way to orthopedic surgeons. First of all, it offers the hope of quick relief. Second, it’s a cash cow for Big Medicine. 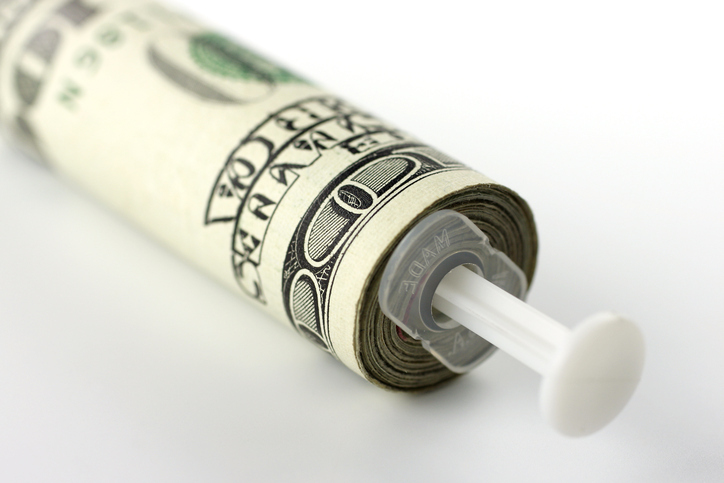 Millions of steroid injections are doled out every year in the U.S.
That equals billions of dollars in profit for pharmaceutical companies. If that weren’t bad enough, let me explain why these injections fail to deliver long-term relief. Steroid injections are solely designed to treat the symptoms of your condition. Unfortunately, many doctors don’t take the time to help their patients find out what’s causing the pain. I’m not really blaming doctors here. I believe most of them have good intentions. They are “practicing medicine” the way they were taught in medical school: Treat symptoms with pills, shots or surgeries. That’s the way the mainstream medical system is designed. The longer your pain lasts, the longer they can “treat” you. And that means more money in their pockets. You only have to check out this article for proof that America’s behemoth medical system has no interest in curing you. 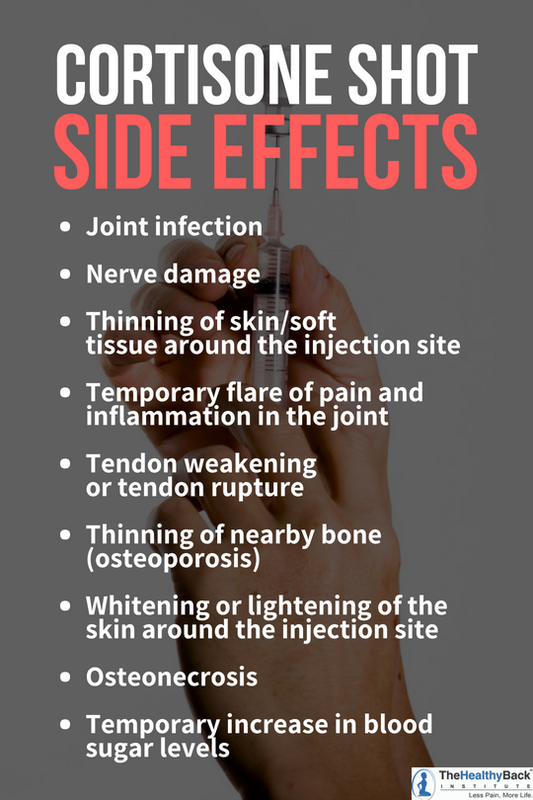 One of the most frustrating possible side effects of cortisone injections includes INCREASED pain after the injection. It happens when the cortisone crystallizes, causing pain worse than the discomfort of the inflammatory conditions the cortisone shots are supposed to be treating. And this is not a complete list of potential side effects. With higher doses and repeated cortisone injections, there is a risk of weight gain, injury of joint tissue, weakening of ligaments of the joint, bruising or bleeding caused by broken blood vessels near the injection site (made worse if you are currently taking blood thinners), cataract formation, osteoporosis, avascular necrosis, facial swelling and a rise in blood pressure. Some of these are clearly short-term side effects that will resolve over time. But some of these are long-term side effects — or even permanent — that you may be saddled with for life. Side effects that include possible strokes, paralysis and even death (v). Most traditional treatment plans focus only on symptoms. In addition to cortisone shots, your healthcare provider will probably also suggest you take pain relievers… whether that’s over-the-counter anti-inflammatory medications (NSAIDs like ibuprofen and naproxen) or prescription painkillers. Like cortisone shots, these drugs come with their own laundry list of scary side effects. And again, like cortisone shots, they do nothing to address the underlying cause of your pain. The truth is that 99% of back pain is the result of a physical problem, which means it requires a physical solution – regardless of the type or severity of the condition. No pill, injection, or massage can deliver lasting physical changes in – or for – your body. 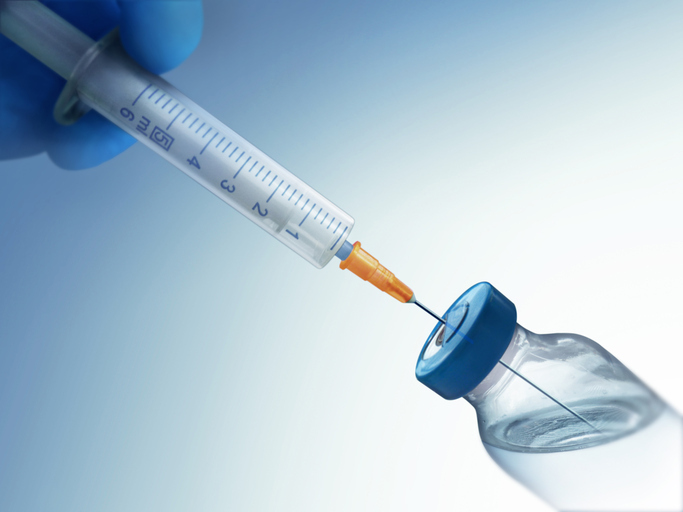 Here are three alternatives to cortisone shots that are both SAFE and EFFECTIVE. Muscle Balance Therapy™ is particularly effective for people with chronic back pain. Never heard of muscle imbalances? Your doctor won’t tell you about them. And chances are, he or she doesn’t understand what they are or how they are the most significant cause of back pain (as well as many other types of pain). In simple terms, a muscle imbalance occurs when you have overdeveloped and tight muscles in one area of your body while the opposing muscles are weak and stretched out of their normal position. These imbalances can happen anywhere on the body and often develop as the result of the routine things you do while on the job, playing sports, or engaging in other activities you enjoy. 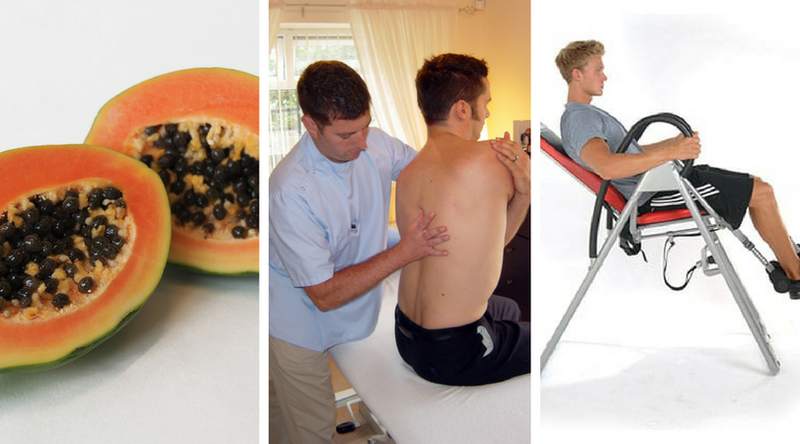 The principles of Muscle Balance Therapy™ address both your pain and the root of your problem. The quick video below explains how muscle imbalances cause all sorts of back pain. The best and easiest way to identify and fix your muscle imbalances is with my Lose the Back Pain® System. Your body also needs proteolytic enzymes to shut down the inflammation process and clean up excess fibrin, or internal scar tissue, that’s created as your body tries to heal from whatever caused your pain in the first place. The problem is your levels start to nosedive after about the age of 27. You need to replenish them. You can get different enzymes from foods — pineapples (bromelain) and papaya (papain) are good examples. But the easiest way to get the proteolytic enzymes your body needs is with a dietary supplement. The best will contain a variety of different enzymes as well as other pain-relieving natural ingredients. But proteolytic enzymes do much more than reduce pain and inflammation. 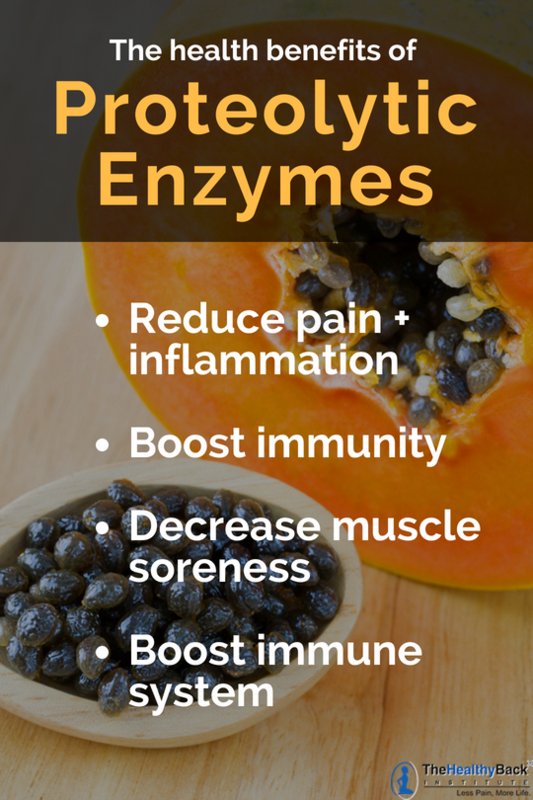 You can read more about the numerous health benefits of proteolytic enzymes right here. This action forces waste out and draws in fluid around your discs, helping to realign your spine when used in the long-term. While you’re here, I encourage you to browse our full database of treatments for various pain conditions, which you can access by clicking right here. Stay up to date with the most current alternative health information by checking out some of our other articles. ii “Allergic Reaction” Cleveland Clinic Center for Continuing Education (clevelandclinicmeded.com) Acc Oct. 19, 2018.
iii Scott, A. “Corticosteroids: short-term gain for long-term pain?” Lancet. 2010 Nov 20;376(9754):1714-5.